President Donald Trump and first lady Melania Trump welcome French President Emmanuel Macron and his wife Brigitte Macron during an arrival ceremony on the South Lawn of the White House, April 24, 2018. President Donald Trump and French President Emmanuel Macron participate in a military review during a state welcome ceremony at the White House, April 24, 2018. President Donald Trump and French President Emmanuel Macron walk past a group of children during the official arrival ceremony for Macron and his wife Brigitte Macron on the South Lawn of the White House, April 24, 2018. EPA chief Scott Pruitt waits on the South Lawn of the White House for the start of the arrival ceremony welcoming French President Emmanuel Macron hosted by President Trump at the White House, April 24, 2018. French President Emmanuel Macron kisses first lady Melania Trump during an arrival ceremony at the White House, April 24, 2018. President Donald Trumpand French President Emmanuel Macron wave to invited guests from a balcony during a state arrival ceremony at the White House, April 24, 2018, along with their wives. French President Emmanuel Macron and President Donald Trump walk into the White House following the Arrival Ceremony, April 24, 2018, in Washington, D.C.
Senior White House Advisers Jared Kushner and Ivanka Trump arrive for the State Dinner in honor of French President Emmanuel Macron at the White House, April 24, 2018. Treasury Secretary Steven Mnuchin and his wife Louise Linton arrive at the White House for the state dinner in honor of French President Emmanuel Macron, April 24, 2018 in Washington, D.C.
CIA director Mike Pompeo and his wife Susan Pompeo arrive for the state dinner with French President Emmanuel Macron and President Donald Trump at the White House, April 24, 2018. House Speaker Paul Ryan and his wife Janna Ryan arrive for the state dinner with French President Emmanuel Macron and President Donald Trump at the White House, April 24, 2018. President Donald Trump and the first lady Melania Trump host their first state dinner, welcoming French President Emmanuel Macron and his wife Brigitte Macron. 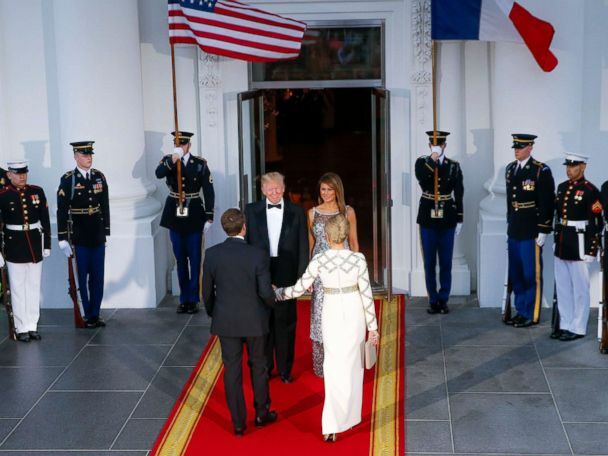 <br><br> President Donald Trump and First Lady Melania Trump greet French President Emmanuel Macron and his wife Brigitte Macron at the White House before a State Dinner, April 24, 2018. President Donald Trump and first lady Melania Trump welcome French President Emmanuel Macron and first lady Brigitte Macron on the North Portico for a state dinner at the White House, April 24, 2018 in Washington, D.C.
President Donald Trump shares a toast with French President Emmanuel Macron during the state dinner at the White House, April 24, 2018 in Washington, D.C. 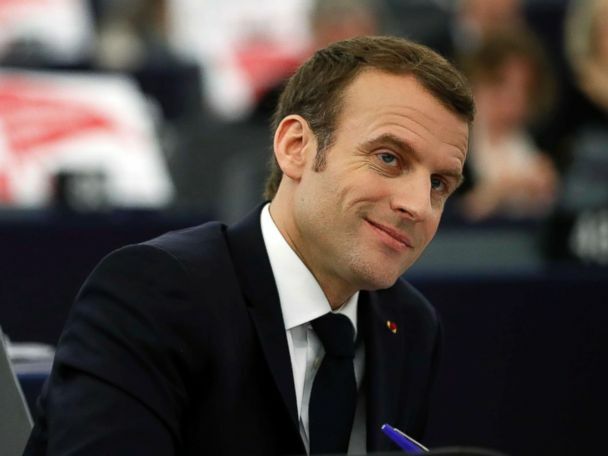 The White House hosted the French president on Tuesday.